Street play video from Kerala based on Gauri Lankesh murder is going viral on social media as RSS supporter’s murder. A video with the caption ‘केरल में RSS समर्थक हिन्दू महिला को मुस्लिमों ने गोली मारी…! 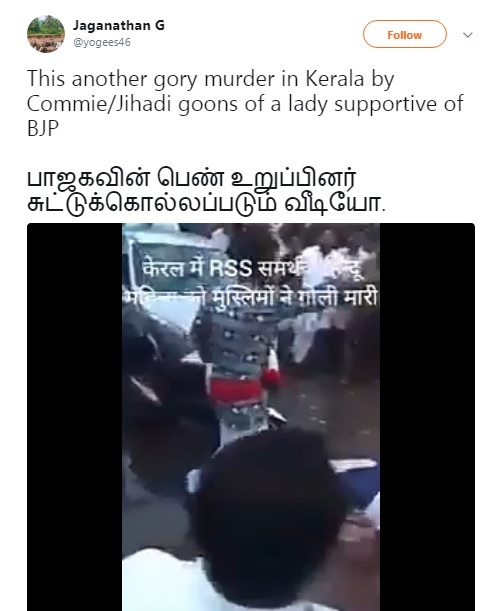 !’ is going viral on social media claiming it is a ‘gory murder of a BJP lady supporter from Kerala by Commie/ Jihadi goons’. However, it is neither a ‘murder’ of a BJP supporter nor a murder in reality. The video shows a street play which portrays the murder of a journalist by RSS members in Kerala for writing against them. The play emphasizes, ‘Silence against fascism is dangerous’. The video was first debunked by India Today on Wednesday in this article FACT CHECK: Was a Hindu woman murdered by leftists, Muslims in Kerala? 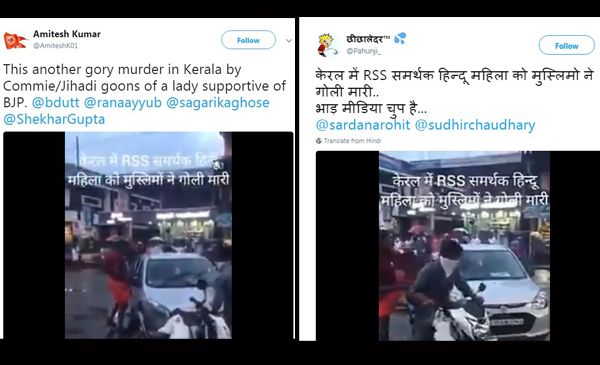 The Newsminute reports that the video was a clipping of a street play performed by the Democratic Youth Federation of India in Kalikavu in Malappuram district based on the murder of journalist Gauri Lankesh on September 5 allegedly holding RSS responsible for the murder. 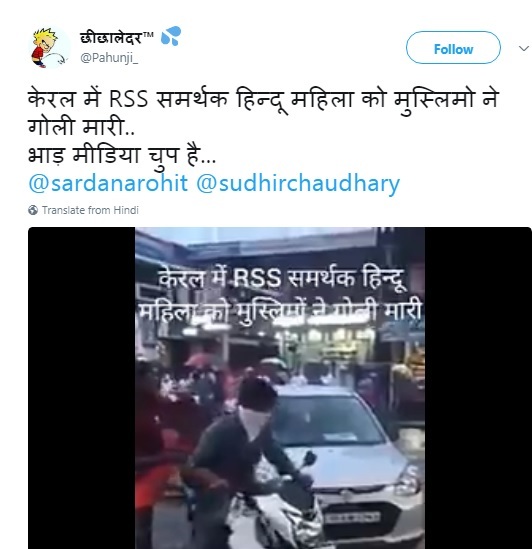 Below is the video shared on twitter by a handle @AmiteshK01. The video is being shared showing it as a real life murder caught on camera in a bid to provoke the sentiments of the Hindus against the left parties and Muslims in Kerala. Lead Actor: She fought and stood against the RSS. Spoke against them. Atlast, she was killed by RSS. Get and tie them up. For what? Why did you kill this poor journalist? Attackers: We, the RSS, patriots. Lead Actor: Did you hear them? They who betrayed the freedom struggle, they who shot Mahatma Gandhi. They are RSS. It is dangerous. Silence is dangerous. This silence, even after fascism has entered your kitchen, is dangerous. Onlooker: Yes, silence is dangerous. Lead Actor: RSS, who eliminated around 2000 of the minority community in the soil of Gujarat. RSS, who killed Kalburgi, Govind Pansari. RSS, who eliminates those who write and speak. They are a threat. The video is going viral with several people sharing the video in different languages as well. Both the handles @Amiteshk01 and @pahunji_ are followed by @PiyushGoyaloffice, one of the verified Twitter handles associated with Railway Minister Piyush Goyal. This video has also been shared several times on Facebook since yesterday. By searching for, केरल में RSS समर्थक हिन्दू महिला को मुस्लिमों ने गोली मारी…!! on Facebook you get to see various public posts sharing the video as ‘the murder of RSS supporter’. Supporters from both the right wing and the left wing have blamed each other for the death of Gauri Lankesh. Activists, journalists and politicians have come under fire for blaming constitutents of the Sangh Parivar for the murder of Lankesh and linking it to the killings of rationalists Narendra Dabholkar, Govind Pansare and M. M Kalburgi in the last few years. The BJP has also sent a legal notice to historian Ramchandra Guha for linking the Sangh Parivar to Lankesh’s murder in an interview to Scroll and column in the Hindustan Times.